The third American Football game to be played in London this season took place at Wembley Stadium recently. With whispers on both sides of the pond that a permanent London based team could be announced in the next couple of years, we look at how the British public are responding to the sport using YouGov SportsIndex. YouGov metrics elucidate how the games are altering perception and awareness of the sport. 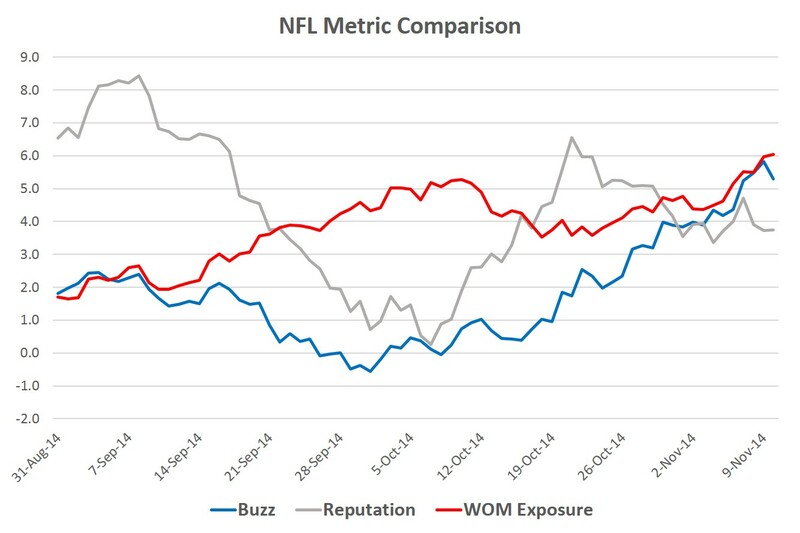 The NFL’s buzz rating increased to its highest level since the season began at around the time of the third game. The score rose from a low of -0.6 at the beginning of October to +5.8. Similarly, YouGov, WOM rating (Word Of Mouth) shows the same pattern. We not only see an increase around last weekend’s game, but around the previous matches that occurred earlier in the year. The score has rose to a high of +6.0 around the time of the second London game. Clearly the marketing efforts, extra TV exposure, and events like the ‘fan day’ on Regent Street are helping to introduce the game to a new audience. Our data also shows that the reputation of the league is recovering from various scandals that engulfed the sport in early October. There were major controversies surrounding accusations such as domestic abuse . However it appears that, although it has not recovered to previous levels, there are better signs there. YouGov Profiles divulges small trends about the American Football fan, while revealing opportunities for league marketers and sponsors. They are more likely to be positive towards Adidas and Nike, while also watching test cricket, the Champions League and the NBA. Video games and cars also rank highly in their interests. Targeting this group may be key to further expansion. So how do the British public react more generally to games being in London? YouGov internal polling shows that an encouraging 28% of people believe it to be a good thing that games are played in the UK, against only 7% who say it is a bad thing. Three in ten believe it would be a good thing for the city to have its own team against 8% who say a bad thing. What’s more, almost four in ten (37%) say it would be a good thing for the UK economy, against 4% that say bad. NFL bosses can be satisfied therefore. Sell-out crowds and increased excitement around the sport shows the game is building momentum in the UK.